The ability to communicate effectively is something most of us take for granted, but for many people affected by cerebral palsy (CP), effective communication is difficult. You may be concerned that your child with cerebral palsy is lacking the support that would allow him or her to communicate in the best way possible. If so, Bolt Burdon Kemp can investigate whether your child has a claim for compensation and, through the claim, help you fund the communication technology your child needs. That 10-year-old was permanently paralysed in all four limbs. He could see and hear, but not speak; he could not control his head movements and could not even sniff. He was completely aware of his surroundings and his condition, but totally dependent on other people for all activities of daily living. His intelligence was unaffected and his life expectancy was normal. He could, with effort, just grip with his left hand, enough to move a switch. By the age of 10, he had learned to read, and he could type 70 words. No doubt, in 1985, when mobile phones were only just being developed and the Web was not even invented, the money earmarked for this boy’s communication aids was considered plenty. But, with the huge advances made in technology since then, that money was probably all spent by the time he reached the end of his teens in 1995. What communication technology is available today? The short answer is that there is now an overwhelming amount of specialized communication technology out there. Not only are there many low-tech aids such as visual display boards and pointers, grids, mats and symbols, but there is also a huge range of high-tech options using the latest computer aids. This is not to mention mainstream technology, such as iPads and iPods, which you can customize as communication tools. All these developments have revolutionized the way many people with communication disabilities can interact with the world: they allow them to make choices, control their environment, and access learning and develop their education – in fact, do almost everything their peers are doing. 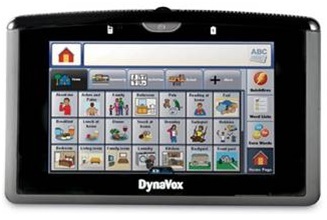 However, provision of what’s known as Augmentative and Alternative Communication (AAC) technology is patchy. It’s also hard for many parents to keep abreast of developments in this field and find out just what would suit their child best. What help and advice are available? Clearly, when you are deciding what aids would be best for your child, getting expert, impartial advice is essential. The ACE Centre, is a not-for-profit organization that offers this expertise. The Centre works with people of all ages who find communication difficult because of a physical impairment, language disorder or learning disability. shows what they do and how they work with people with complex communication needs. It’s also a great introduction to the challenges of matching the right technology with the right person. Some devices may also be waterproof, or have rechargeable batteries offering many hours of use. Some even let you choose from a variety of natural-sounding child and adult voices, with inflection and emphasis, including laughter, crying, shouting and whispering. As well as fast access to a complete set of communication vocabulary, the kit might include a built-in calendar, to remind your child of events and keep track of tasks like taking medication. and for free hands-on demonstrations of new devices, it’s well worth going to one of the regular roadshows organized by Communication Matters. The future will also see increasing use of wearable technologies such as Google Glass and technologies that anticipate and attend to your child’s needs. Advances in the field of neuroscience have also been dramatic: a pilot study of the BrainGate2 Neural Interface System aims to find out whether people can use it to control a device simply with their thoughts or just by imagining the movement of their own hand. Some people may say that the future is here already, but we believe the future is yet to come and that this is why we need to ensure that we don’t limit your child’s opportunities through an inability to predict what technological innovation may bring. Here at BBK we look at all the issues that are relevant to any complex communication need when we put together a claim for funding your child’s communication technology. We take into account your child’s unique circumstances and needs and the professionals and others involved in your child’s care – now and in the future. I am a Partner at Bolt Burdon Kemp specialising in child brain injury claims. If you or a loved one are concerned that you may have an undiagnosed brain injury or you are concerned about treatment you have received, contact me free of charge and in confidence on 020 7288 4825 or at jochapman@boltburdonkemp.co.uk for specialist legal advice. Alternatively, you can complete this form and one of the solicitors in the Medical Negligence team will contact you. You can find out more about the team Medical Negligence team.